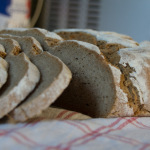 Finally after three days of mixing and waiting my first rye sourdough experiment was successful. 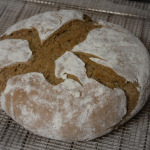 At this point I decided to make the Black-Beer-Bread from my baking book. 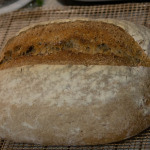 First I prepared the sourdough and the Poolish. 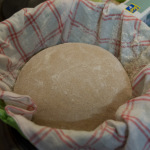 After another day waiting I could mix the main dough, let it rise and start baking at last!!! Voila, it was worth waiting so long. 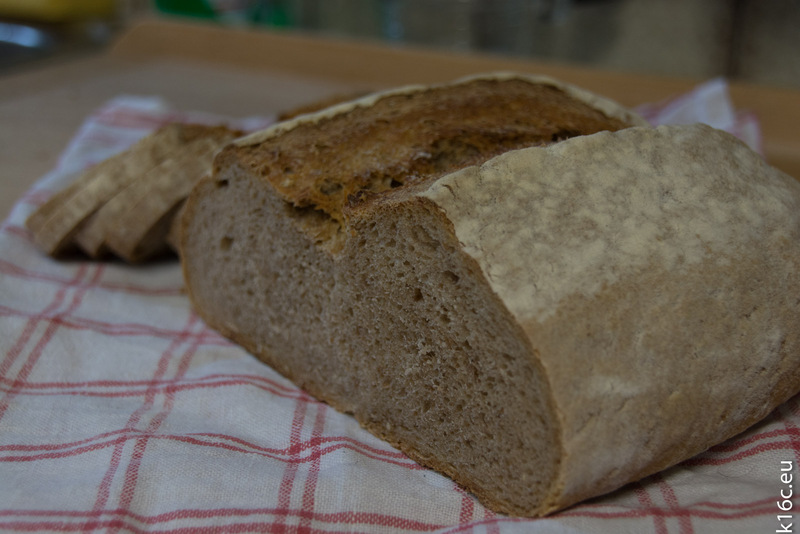 I was rewarded with a wonderful fluffy, good smelling (and tasting) bread with a crunchy crust. Yummy! 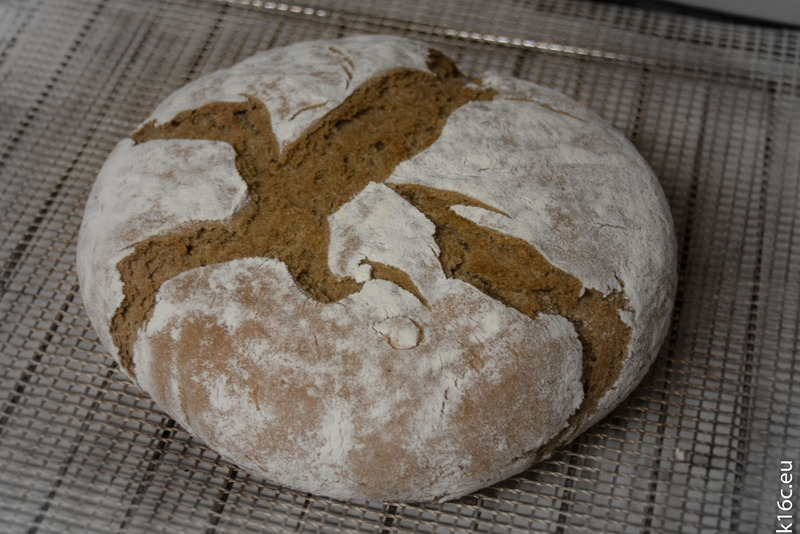 Since this bread was such a success I already baked two other breads in the meantime. 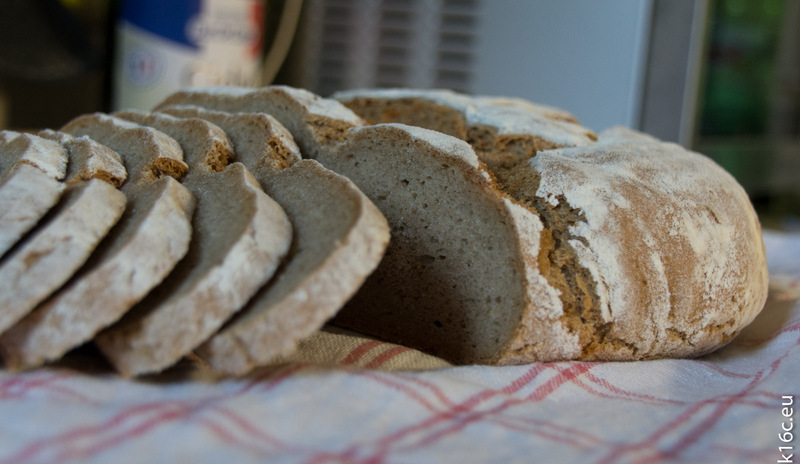 A rye mix bread and a franconian farmhouse bread. 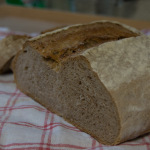 add another 10g rye flour and 10g water, mix it, let sit .. guess what… another 24h at 24°C. Your sourdough starter should now be the double of its starting volume and smell sourish, comparable to apple vinegar. 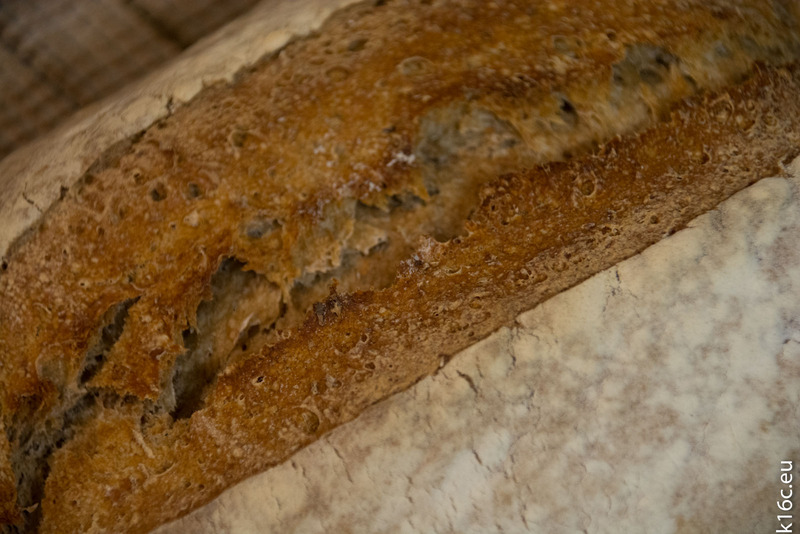 You can store your sourdough up to two weeks in the fridge without “feeding” it. 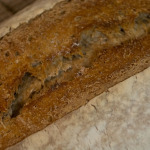 If you want to use the sourdough for baking, just refresh it (feed it) as described in step 3. Mix everything together and let ripe for 20h at room temperature. The volume should increase and the dough shall contain bubbles. Same procedure as for the sourdough. Mix everything in the heavy duty mixer for 5 minutes on lowest speed and 5 minutes on second speed level. Let the dough rise for 1h at 24°C in a airtight container. Then fold the dough on a floured counter top and put it back into the container for one more hour. Now knead the dough with hands and shape it to a ball. Let the dough relax for 20min. 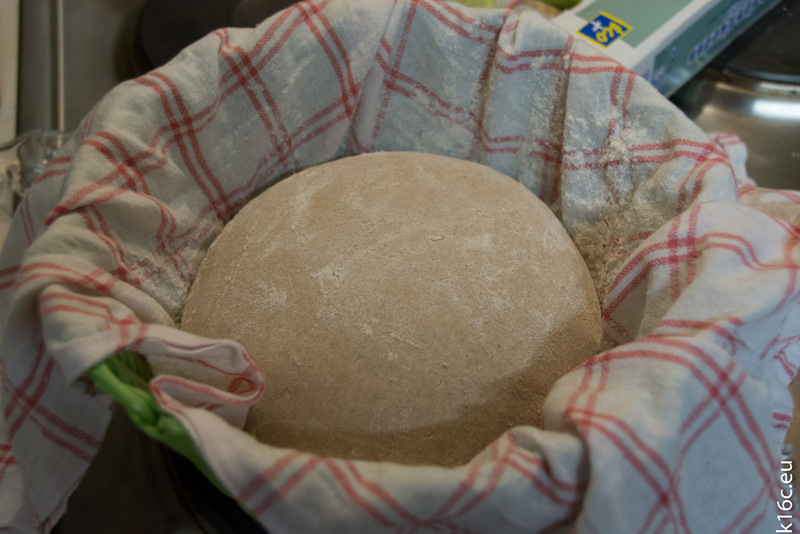 Make the loaf longish and let it rise for 45 min at 24°C in a proving basket with closing on top. Turn out the loaf on a baking tray covered with baking paper. Make a lengthwise 2cm deep cut. 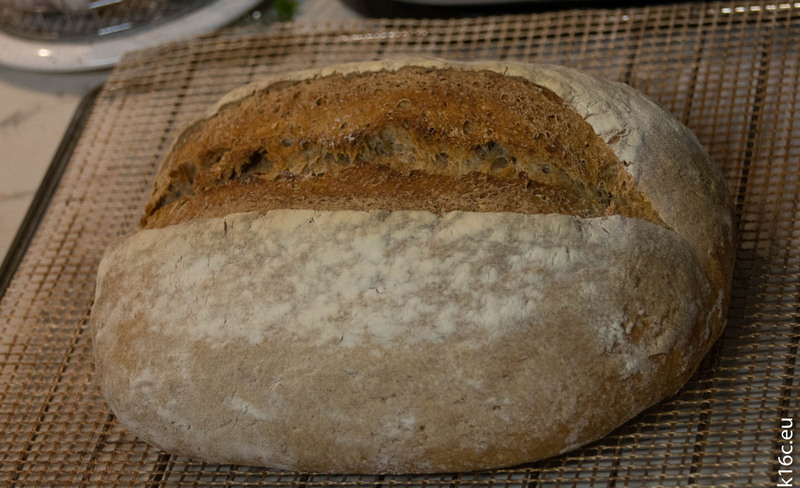 Bake the bread in a preheated oven at 250°C for 45 min with steam (a bowl of water does fine). After 10min open the oven door and let the steam out (take the bowl out). Lower the temperature to 220°C. For the last 5 min open the oven door a bit for a crisp crust. Let the bread cool down on a grate.